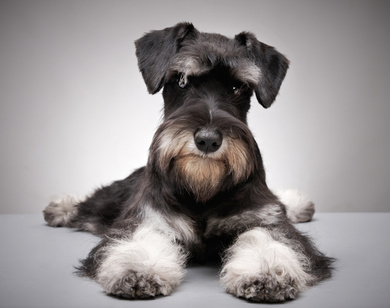 The Miniature Schnauzer is one heck of a dog breed. It is very popular in the United States. I grew up with a Miniature Schnauzer in NJ and I can attest to the “fun” factor associated with the Miniature Schnauzer! Her name was “Poco”. That means small in Spanish but my father got her from a breeder in the Poconos in the northeast corner of Pennsylvania; hence her name. Before we got her after Christmas, my mother purchased a dog collar, put it in a small box and wrapped it. My siblings and I were so happy! Finally, a dog! As a sophomore in vet school, she died of renal failure. That was an extremely heart breaking day. Even after 30 plus years of practicing medicine, putting an animal down is still an extremely difficult thing to do. The Miniature Schnauzer is a small dog and will do well in almost any home setting. They like children in their household but are not too keen about other children. This breed is fearless and has lots of guts. It usually does not back down from a challenge. The breed was bred in Germany and the word schnauzer means muzzle. That strong muzzle was used to catch rats and associated with that typical Miniature Schnauzer beard that needs to be combed out all the time because it accumulates food and saliva. The rust colored like staining around the beard and lower extremities is caused by a protein in the dogs saliva that changes the coat color to a rust shade! This breed hates to have that done! This breed simply loves to bark; a very high pitch bark that is stimulated by any sound such as a doorbell, a truck back firing, you name it! For this reason, they are very good little guard dogs and super intelligent. Most people will shave the Miniature Schnauzer leaving a small bib of hair along the lower trunk of the animal. If the coat is left long you have to comb it all the time. If you do not do this with a Miniature Schnauzer, you will have mattes from head to toe; or should I say from the tip of the nose to the tip of the stubby tail! The majority of the Miniature Schnauzer dogs that I usually see are the typical salt and pepper or black-coated dog. It seems that the black Miniature Schnauzer is a bit more docile than the salt and pepper version. Either way, they are still terriers and kings of the world! The Miniature Schnauzer is probably the top breed that suffers from bladder stones. Some of these can be dissolved with special diets but the majority are surgically removed. They also are afflicted with Cushing’s Syndrome, a pituitary-adrenal gland issue. As they age, they often develop signs of left-sided heart failure. It is probably one of the few breeds of dogs that has a syndrome named after it: Schnauzer Comedome Syndrome. These are small black heads seen as the dog ages along the spine of the dog. They can be associated with seborrhea so an appropriate medical shampoo and shaving the effected areas often works. Most veterinarians will also rule out thyroid deficiencies or adrenal gland excesses (Cushing’s Syndrome). Finally, a lot of Miniature Schnauzer dogs are diabetics and are on life long insulin injections. How they get to be diabetics is often different from other breeds compared to the poodle. From personal experience, Miniature Schnauzer dogs will eat anything! This gets them into trouble when they swallow the contents of a trash can. This often sets up a severe case of pancreatitis which than leads to a huge drop in insulin production. Insulin is manufactured in the pancreas. Sure, they have medical issues, but it hasn’t stopped them from becoming one of America’s favorite breeds. With that stoic in your face personality, the Miniature Schnauzer will always warm the human heart. Learn more about the Miniature Schnauzer at Animal Planet’s® Dog Breed Selector.